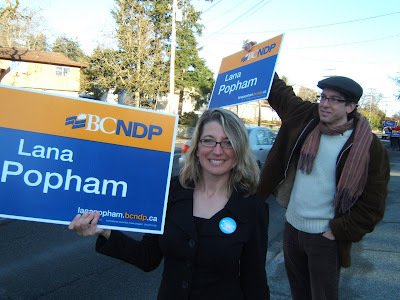 Lana Popham's 2009 Campaign: The Election Has Begun......Finally! It's day two of a 28 day election period. The excitment has built for months and now it is a reality. The fight for our future in BC is going to be a tough one everywhere, but in Saanich South the race will be watched very closely. Getting through the next month will be an adventure. I haven't had very many moments to sit back and reflect lately but I did get a chance to take my bike out on the weekend and ride around Saanich South. Saanich South is an amazing community. The urban/rural split makes it very unique. I feel lucky to live here and I am going to fight hard for the honor of being the MLA. I would love your vote on May 12th!